Through her artwork, Eva Spierenburg examines the role of identity and self-consciousness of the contemporary individual in a complex world undergoing constant evolution. These characters find themselves in archetypal scenes, within which the artist mixes her memories and dreams, with existent stories that are part of the collective patrimony, like the myths of different cultures or the documents of Sartre and Jung. 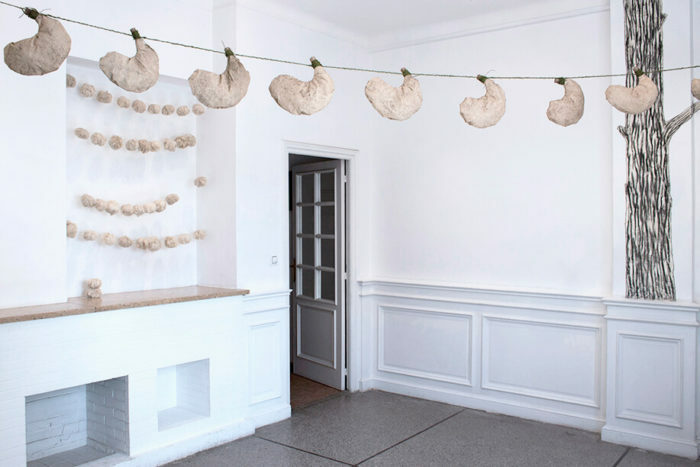 As part of her residency at Le Cube –independent art room, Eva Spierenburg has examined the points of correlation that exist between Amazigh and European tales “Hänsel and Gretel” in particular. Fascinated by the similar patterns Spierenburg works on these archetypes that are revealing of the human soul. 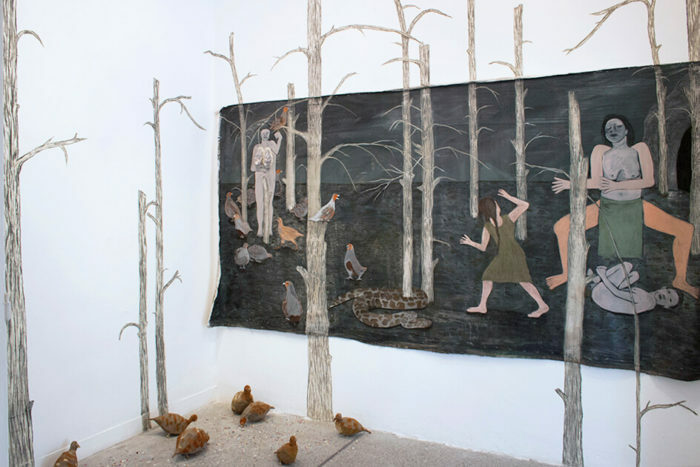 With the installation Le conte des contes, the artist has created a fairy universe: forest, birds, snakes, and a painted scene on a big canvas, hang on the wall. Each material is carefully chosen, for its formal characteristics and colors, but also for their olfactory evocations (the birds presented in Le Cube are covered with spices). On the right, the witch is in front of her cave. Here, Spierenburg borrows the leg posture from the painting of Goya depicting cannibals, and the gesture of the arms is inspired by a drawing of Hänsel and Gretel. A little bit lower, a boy squats on the ground. In the Amazigh version, the boy is ignorant and weak, and is saved by his cunning sister. Consequently, the boy in the painting is represented as a passive character, while his sister is in action. Below is a big snake, symbol of the dark side of the human soul. In one of the versions, the girl marries the snake after she leaves the cave of the witch. She becomes a witch too, and tries to kill her brother several times. On the left of the canvas, is the mother-in-law who, by getting rid of the children, has the partridges for her. This woman has her breasts covered with confetti, pretty colored papers that serve to feed the partridges, but are useless for motherhood, useless for true affection. In the presented video animation, Spierenburg investigates the concept of interaction between the masculine and the feminine: in their dance, the man and the woman injure each other, and are moving in sync with each other. In the European fairy tale, “Hänsel and Gretel” – the boy and the girl – both contribute to their survival, in turn. However, in the Amazigh version, the girl is the heroine. Different roleplays of the masculine and the feminine which is also related to the theory of Jung on Animus and Anima. Eva Spierenburg has graduated in the Fine Arts Academy of Utrecht, in the Netherlands, in 2009. Her artistic practice combines painting, installations and animation.